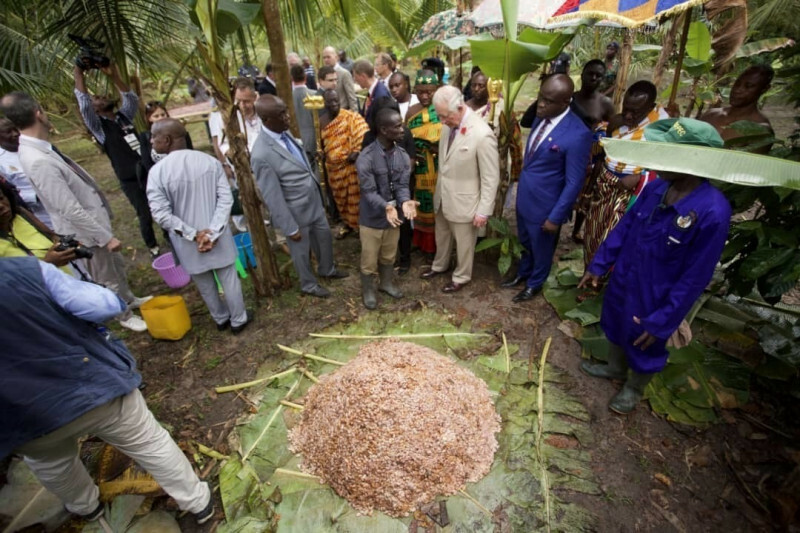 The Prince of Wales visiting an model cocoa farm in Ghana. More than 18 months after launching the Cocoa and Forests Initiative (CFI), which sets out agreed actions to achieve a sustainable and deforestation-free sector, HRH The Prince of Wales has visited key cocoa growing regions in Ghana and the Cote d’Ivoire, to examine first-hand the progress being made and how key players in the supply chain are working toward a sustainable farming model. Yesterday, Prince Charles attended a meeting that brought together senior government representatives from the major growing regions in Africa and international business leaders to discuss sustainable practice in the cocoa industry and key environmental issues. During the meeting, The Prince of Wales was briefed by governments officials and business leaders from the likes of Barry Callebaut, Cargill, The Hershey Company, Mars Wrigley Confectionery, Mondelēz International, Nestlé, Olam Cocoa, SIAT Group, and Touton, on progress made over the past year to implement the key joint commitments set out in the CFI. Both governments recently released their National Implementation Plans for 2018 to 2020, and the participating companies which account for 85 % of global cocoa usage are now finalizing their detailed individual company action plans. These include key players such as Barry Callebaut, Cargill Cocoa and Chocolate, Ferrero, General Mills Inc., The Hershey Company, Lindt & Sprüngli Group, Marks & Spencer Food, Mars Wrigley Confectionery, Mondelēz International, Nestlé, Unilever and Olam Cocoa.